A short reflection after reading Casabella 752. I was very interested in Dal Co’s article, with the title of Lo smalto sul nulla [“Enamel above nothing”], about the controversial (just to be clement) Hotel Marqués de Riscal, by Gehry, and the nihilism which can be said to philosophically found deconstructivism – or any other architectonic theory characterizing the work of the Canadian architect who wisely rejects to declare himself for anyone of them. Reading Benevolo, I was once stroke by the simple but sensible observation that architecture is the most slowly evolving art; for obvious technical and institutional reasons, it definitely carries a delay. Nothing wiser, in my modest opinion. It is true indeed that every age corresponds to its architecture, but the fundamental evolutions however come with the delay of almost a century; particularly from the 700’s, when the world started to accelerate all its vital cycles. It is not a case that Lightening produces definitely ancient régime architectures, Decadence takes to romantic buildings, Pirandello’s ‘900 loiters upon safe positivistic positions: maybe it is just now that Heisemberg starts to move the architect’s hand towards complete indetermination. 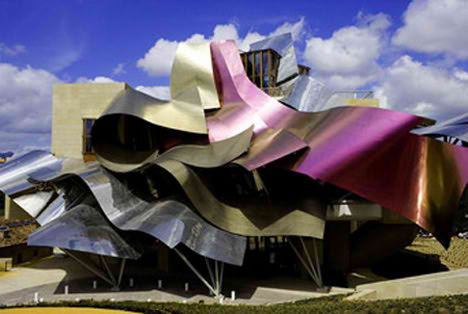 But nothing can justify Gehry for the de Riscal eyesore. A metallic-plate-shaped auto-quotationism covers, maybe for lightening shyness, a whole architectonic nothing. Is this the state of art? Luckily, there are Isozaki and a newly discovered Carlo Scarpa giving a hope to this issue. Jean Nouvel makes his part too, while this time Mrs. Hadid seems to have not much to say.